Continuing my small scale work, I present a pair of 2.5 ton cargo trucks from Academy, and 105mm howitzers from Ace Models. Our photo archives get some more documentation this month. Eric Nordstrom has been kind enough to share some nice detail photos of his grandfather's M7 Priest (scroll all the way down the page) and an M10 Gun Motor Carriage from Mike Bedard. In a much smaller scale, I have a couple of Dragon M4A1 Shermans— including "Derby"—I've been working on for an upcoming diorama. This month we look at a couple of AFV Club ammo sets: U.S. 40mm Gun Ammo Set Brass and U.S. 105mm Howitzer Ammo Set Brass. For eye candy, we have photos of an M12 Gun Motor Carriage shot by Matt Riesmeyer and an M36 Gun Motor Carriage photographed by Mike Bedard. I had a very productive 2012, and I'm just getting around to photographing the fruits of my labors. To start things off, here is a little diorama I put together called Scuttlebutt. AFV Club's M1 40mm Bofors Anti-aircraft Artillery is painted up and I've reviewed the Bofors & M42 40mm Gun Ammunition and Accessory Set. Enjoy. 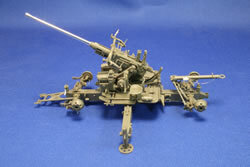 I've completed a construction article on AFV Club's M1 40mm Bofors Anti-aircraft Artillery. Watch for photos of the painting kit next month. Matt Riesmeyer shares photos of an M40 Self-propelled Howitzer that is on the grounds of Ft. Sill. I hope 2013 is a great modeling year for everyone, and for U.S. WWII AFV modeling in particular. We start the year with a couple of older releases from MiniArt: U.S. Military Police and U.S. Motorcycle Repair Crew. And with Bronco's new jeep and 37mm anti-tank gun set hitting the store shelves soon, I have photos of 37mm gun featured at the Ropkey Museum.